The sales managers and engineers from Beston Machinery will go to visit New Delhi, India from 8th to 15th, August. 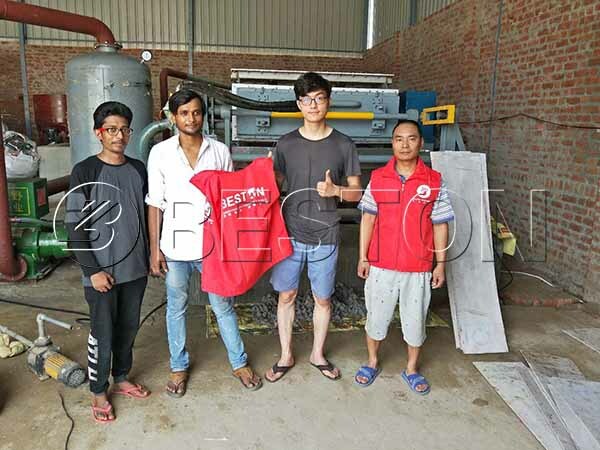 For this trip, we aim to develop a wider market for our paper pulp molding equipment, such as egg tray making machine, in India. During this period, our managers will visit our customers there to know the local market better so that we can provide you with the most suitable products. Meanwhile, we also sincerely welcome new and old customers to contact us for further cooperation. Egg tray making machine price in India may be a reference for many investors. It will be helpful for you to make a great deal. Beston Machinery is a leading egg tray machine manufacturer in China, which can provide customers with the best products at a reasonable price. During the past 20 years, we have developed various pulp molding manufacturing lines to meet different requirements. Thanks to mature technology and rich experience, Beston has successfully reduced the egg tray making machine cost. That’s why our egg tray machines have been widely exported to many countries, including India, South Africa, Algeria, Syria, the Philippines, etc. We can find both egg trays and egg cartons in the supermarkets, which are applied to protect eggs. The most commonly used egg trays or cartons are made from paper pulp, namely, pulp moulding products. Due to the handiness and environmental friendliness, pulp products are getting popular. In addition to egg trays and boxes, we can also see fruit trays, paper shoe trays, cup trays, etc. With the wide range of application of paper trays, the pulp moulding production line is becoming mature and common. However, there are some differences between various the paper tray moulding machines. As a professional egg tray machine supplier, Beston has rich experience and the best technology to provide our customers with the best products and service. Here we will talk about the diversities between egg tray making machine and egg carton manufacturing machine. Rotary egg tray machine is the most popular business plan among investors. It is also a hot product of Beston Machinery, which is getting mature day by day. We have successfully exported our products to many countries worldwide. Based on our 20 years of experience, here is a brief summary of rotary paper egg tray making machine. What Is A Rotary Egg Tray Machine? Egg tray machine is used to recycle waste paper into various paper trays, such as egg trays, fruit trays, bottle trays, etc. It has different types, including rotary egg tray machine, reciprocating egg tray machine, etc. The difference lies in how to demold the trays. The former one is more effective and safer. With the mature technology, we developed our rotary egg tray machine from one side of forming molds to 12 sides. So that our egg tray production line is of full specifications to meet customers’ needs. Read moreHow to Maintain An Egg Tray Machine? Egg carton making machine is a new type of pulp molding production line. Actually, it shares the similar working process of paper egg tray making machine. But there are still some differences you need to know. Here is an overview of the egg carton manufacturing process from Beston Machinery. As an experienced egg tray making machine manufacturer, we believe the information below can be helpful. In addition, we have professional teams to offer you various pulp molding machines at a very reasonable price. Moreover, we have rich exporting experience with many countries, such as India, South Africa, Algeria, Russia, Angola, etc. 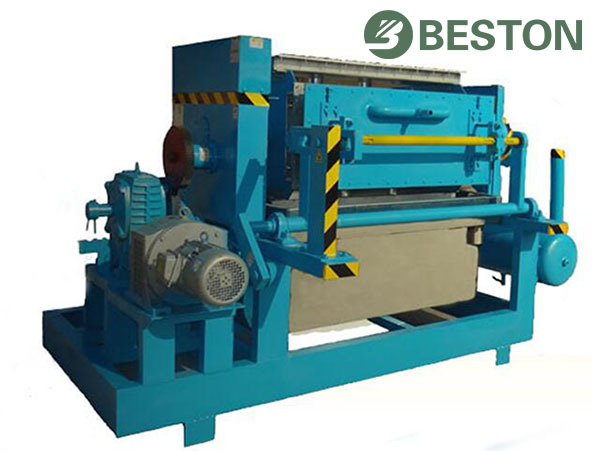 Undoubtedly, Beston will be your best choice for paper tray forming machine. How to Get A Low Price Egg Tray Making Machine? Low price egg tray making machine is attractive. However, it is more important to buy a piece of high-quality pulp molding equipment. It seems a pie in the sky. Possible? Of course, if you choose Beston Machinery, a leading egg tray machine manufacturer. We always provide customers with top-quality paper egg tray machines at the best price. Moreover, we’d like to share you some helpful tips on how to invest a cost-effective pulp molding production line. Here we go. Read moreHow to Get A Low Price Egg Tray Making Machine? Are you going to invest a paper egg tray machine? There must be a lot of questions you want to know about a pulp molding production line. Beston Machinery is an experienced egg tray machine manufacturer. On the basis of our rich experience, we have proposed a specific egg tray manufacturing business plan for investors. Cost of egg tray making machine is the first concern of customers. However, you may know much about paper egg tray making machines. But you may not be aware of how much they actually cost. Beston Machinery is a qualified egg tray machine manufacturer in China. Based on our rich manufacturing and exporting experience, here is an overview of the average cost of egg tray making machine. Egg tray is a kind of protective packaging product, which is often used to place eggs. For one thing, it makes eggs easy to carry and store. For the other thing, a well-designed egg tray will help you sell more eggs. Today we can find various egg trays on the market. As for the egg tray raw material, there are paper egg trays, plastic egg trays, expanded polyethene (EPE) trays, etc. Among them, paper pulp trays are getting popular. Beston Machinery supplies paper egg tray making machines at various specifications. Moreover, we can also make egg carton machine for sale, apple tray making machines, etc. to order. Welcome to contact us!